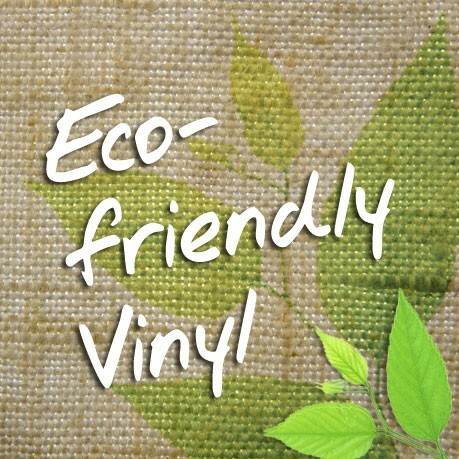 What does “eco friendly” vinyl mean? Polyvinyl chloride – PVC – is the most toxic plastic for our health and it’s not so good for the environment either. First, it’s made from petroleum, one of our scarce natural resources. Globally, over 50% of PVC manufactured is used in construction, in products such as pipelines, wiring, siding, flooring and wallpaper – as well as a host of other products, including fabrics. As a building material PVC is cheap, easy to install and easy to replace. PVC is replacing ‘traditional’ building materials such as wood, concrete and clay in many areas. Although it appears to be the ideal building material, PVC has high environmental and human health costs that its manufacturers fail to tell consumers. From its manufacture to its disposal, PVC emits toxic compounds. During the manufacture of the building block ingredients of PVC (such as the vinyl chloride monomer) dioxin and other persistent pollutants are emitted into the air, water and land, which present both acute and chronic health hazards. During use, PVC products can leach toxic additives, for example flooring can release softeners called phthalates. When PVC reaches the end of its useful life, it cannot be recycled, so it must either be landfilled, where it leaches toxic additives, or incinerated, again emitting dioxin and heavy metals. When PVC burns in accidental fires, hydrogen chloride gas and dioxin are formed. No other plastic contains or releases as many dangerous chemicals. There’s no safe way to manufacture, use or dispose of PVC products. And yet we see the advertisement of “eco friendly” vinyl. What does it mean? Vinyl is commonly used as a shorthand name for PVC. Usually, when a product is referred to as “vinyl,” it is comprised primarily of PVC. Occasionally it also may refer to polyvinylidene chloride (PVDC) a closely related compound, which is used in food wraps (‘Saran’) and other films. This product shares most of the same environmental health problems with PVC. polyvinyl butyral (PVB), used in safety glass films. What makes PVC different from the other vinyls is the addition of a chlorine molecule (The “C” in PVC and PVDC stands for chlorine). Chlorine is the source of many of the concerns with PVC, such as the generation of dioxin, a highly carcinogenic chemical produced in both the manufacture and disposal of PVC. Due to its persistent and bioaccumulative nature (it travels long distances without breaking down and concentrates as it moves up the food chain to humans) dioxin has become a global problem and an international treaty – the Stockholm Convention on persistent organic pollutants (POPs) – now prioritizes the elimination of processes that produce dioxin. Some of the non-chlorinated vinyls (EVA, PEVA, PVA and PVB) are now beginning to be used as direct substitutes for PVC. EVA has been in use for several years as a chlorine free substitute for PVC – primarily in non building materials like toys and athletic shoes, but occasionally as a protective film or binder. In the building industry, post-consumer recycled PVB is now beginning to be used to replace PVC in carpet backing. Absence of chlorine alone does not make these other vinyls the final answer in the search for green polymers. There are still plenty of toxic challenges and untested chemicals in the life cycle of any petrochemical product. As is the case with most other polymers competing with PVC, however, the weight of available evidence indicates that the absence of chlorine in the formula will generally render the lifecycle environmental health impacts of PVB and the other vinyls less harmful than PVC – and initial study is bearing this out. Like the polyolefin plastics, the use of PVB and the other non-chlorinated vinyls represents a step forward in the search for alternatives to PVC. In summary, with the exception of paints, glues and certain films, “vinyl” as a product description almost always means made of PVC. The term vinyl in ethylene vinyl acetate (EVA), polyethylene vinyl acetate (PEVA), polyvinyl acetate (PVA), and polyvinyl butyral (PVB), however, does not refer to PVC and does not raise the same concerns associated with chlorinated molecules like PVC. When in doubt about the use of the term “vinyl”, ask if it is PVC. For virtually all PVC applications, safer alternatives exist, using more sustainable, traditional materials – such as paper, wood or local materials. PVC can also be replaced by a variety of other, less environmentally damaging plastics, although most plastics pose some risk to the environment and contribute to the global waste crisis.